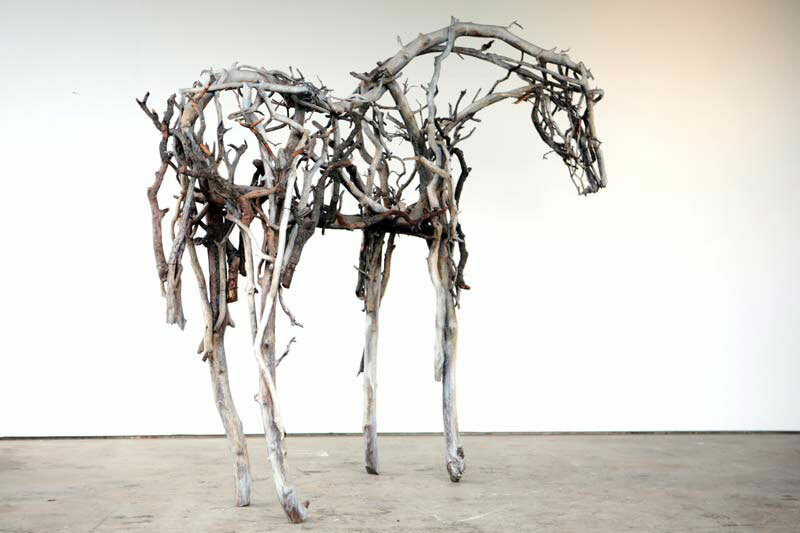 Butterfield has been creating life-size horses from sticks and plant material from which she creates a casting in bronze at the Walla Walla Foundry in Washington State. These large horses have been the subject of several public outdoor commissions and are generally slightly larger than life size. Furthermore, being made of bronze, they have the ability to be placed out of doors. 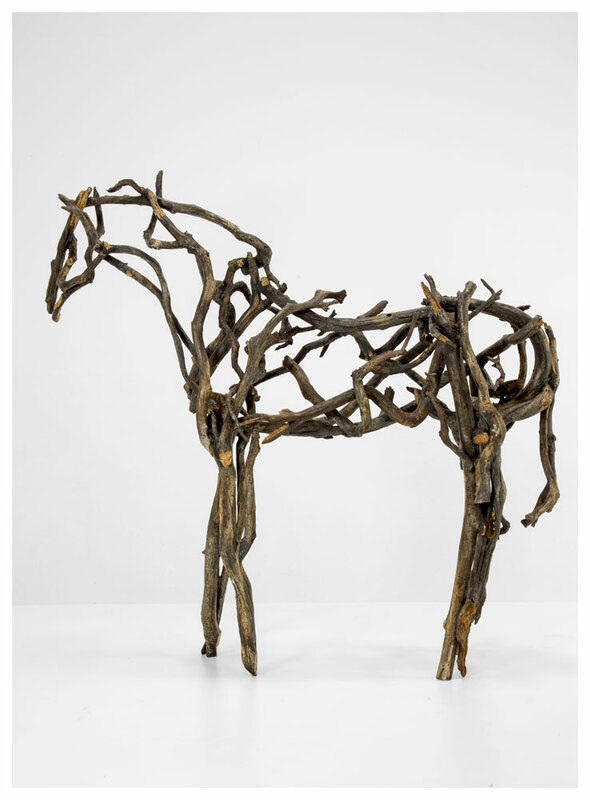 Butterfield sculpts the original piece by piece by fastening logs, branches, sticks, planks, and boards onto an armature that gives the basic posture of the particular horse. After fashioning the horse out of wood and organic material, the piece is photographed from all sides and angles, particularly the areas where individual pieces are joined. These photos are used to reconstruct the various elements after casting. 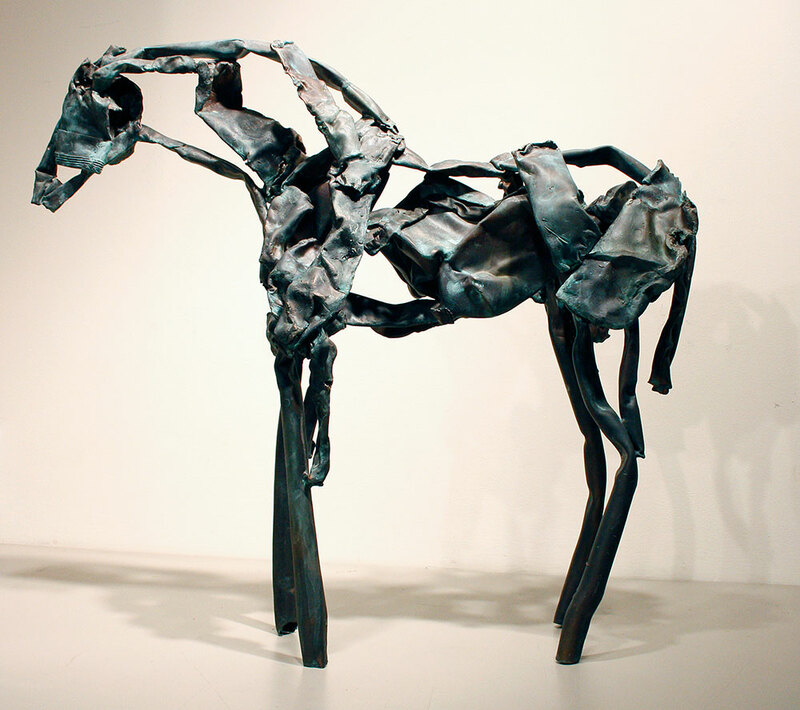 In the 1980s Butterfield began building full-size horses from found metal salvaged from scrap yards. While the unevenly rusted surface of the found metal work suggests the coloring of types of horses - an appaloosa, chestnut or perhaps a dapple-gray - Butterfield is not obsessed with replicating any aspect of the horse in specific. Nonetheless, in any one of the sculptures, the architectural structure, contour, and mass of the horse are readily apparent. Often, the weighty and crumpled metal pieces used for the shoulders and rump suggest powerful muscles. Carefully choosing from her scrap yard of parts and pieces, she suggests some of the most delicate and surprising aspects of the horse. A massive metal fire escape was twisted into a powerful stallion in a large work that is part of the collection of the Seattle Art Museum. In another work, the curve of an industrial part suggests the neck and mane of the horse in a most uncanny way. Many of the recent works are made of found metal; most of it bearing colored paint remnants from its original surface. The artist collects metal from wrecked cars, industrial salvage yards, demolished buildings and construction sites and combines them in her Montana studio to create these equine sculptures. Some of the works have utilized three-dimensional letters scavenged from commercial signage bringing an unexpected new element into play. Butterfield has also recently used painted metal from flat signage. In constructing her horses Butterfield tries to alter the "as found" shape of the metal pieces as little as possible. The separate parts are not often individually important but gain an elegant context in the artists ability to meld them into such a suggestive sculpture. Occasionally, recognizable elements such as a child's tricycle can still be identified within the tangled assemblage of metal parts. Butterfields small sculptures measure roughly three feet tall by four feet in length, a size that the artist relates to ancient Chinese ceramic sculptures of the Tang Dynasty. They are not intended to be seen as colts or as baby horses, but as miniatures relating to artworks depicting horses. Butterfield has never been interested in the naturalistic depiction of horses in the common sense of realism in the art world. She prefers that her small works be viewed on pedestals to alleviate any confusion as to her intention regarding the abstract nature of her sculpture.